At the Show in Show Low, AZ! After a fairly dry winter we are now getting rain, in June, and it never, ever rains in June… go figure! We had a fairly large storm on Friday afternoon and evening, and although it looked like we were going to be rained out on Saturday, it blew through and we had a lovely afternoon with typical deep blue skies, white puffy clouds and not a lot of wind. Making the trek up from the valley for this years show was Bob & Betty Bailey, Dave & Anne Bennett, Larry & Brenda Besore, Charlie & Danise Cover. Steve Besore was already up at his home east of Show Low, and Frank & Rose Svancara drove over from their cabin in Greer, and of course Michelle & I were already here. Not a bad showing for the club. 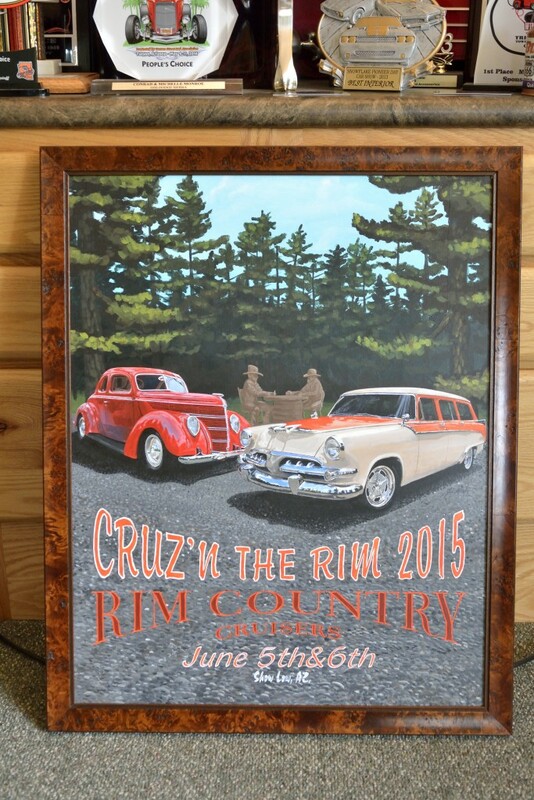 The Cruz’n the Rim Car Show is hosted by the Rim Country Cruisers who are based in the White Mountains. The proceeds from this year’s show will be given to the Salvation Army. The Salvation Army is one of the most efficient charities returning almost all of the money donated back to the most needy folks in our community. I believe that I had heard that there were around 150 cars entered this year, so after a near death experience a few years ago it has come back better than ever. Rick Fernau and the Rim Country Cruisers did one heck of a job organizing and putting the show on, I cant think of any problems or issues. Good Job! One of the lessons learned with small shows like this, it is very near impossible to have any kind of meaning full “class” structure for judging, so they basically did away with it and had the public vote on the cars that they liked, and the participants voted on the cars that they liked. An award was given to the highest and second highest public vote getters. They then handed out the Top Twenty Awards based upon participants votes. The club did well in the Top Twenty with Steve Besore, Larry Besore, Bob Bailey and I on the receiving end. In addition to the Top Twenty they handed out Trophies for Best MOPAR, Best GM, Best Ford, Best Convertible, Best Import, Best Paint and Best Interior, there was another trophy given out, but my old man memory doesn’t remember what it was for. Also they had a Mayor’s Pick, which Dave Bennett won for the second time! Charlie presented our “We Dig Your Ride” award – made by Alan Mitchell, but again memory fails as to which car received it… Gonna have to start hauling a tape recorder with me. Sigh! The highest vote getter in the Participant’s voting also received a major Trophy. I am proud to say that Michelle and I received the Best Interior Award, it is pretty large and takes up a fair amount of floor space so I may just haul it down to the Dreaded Valley and present it to Lui Contreras who did the work! BTW: this is the second Best Interior award that Bettie has won – props to Lui for his great work! The Rim Country Cruisers took the illustrated design art work that I had done for the tee shirt and posters to a local artist who rendered it in oil on canvas which he donated to the silent auction with the proceeds going to the Salvation Army. The OTHG – Phoenix club members plus Rick Fernau bid on and won the auction, and then turned around an presented it to me. I will always treasure this gift from our friends… Michelle and I cannot thank you enough! Michelle went all out again and put on another one of her Show Low Days patio parties, I of course was too busy talking to take any photos, so you will have to use your imagination! We had a nice turn out of 50-60 car lovers and the best part was that there were only a few small leftovers, so my diet can stay intact. 2015 Blast From The Past! At the Show in Alpine, AZ! Just a quick post to make sure the slide show plug in is working correctly. Format GalleryPosted on June 8, 2015 June 8, 2015 Categories Car Shows, In ArizonaLeave a comment on 2015 Blast From The Past!